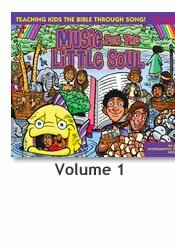 Music for the Soul introduces a great new way for equipping the next generation with the word of God in a way they'll never forget!! "These songs are fun, versatile and professional -- a must for those in children's ministry! I have used them in assembly worship, ensemble and choir pieces, as all school finales for musicals and Christmas concerts, as choreographed lip synchs and musical backgrounds in black light theatre presentations. The possibilities are limited only by my imagination. Thank you, thank you, thank you for including the accompaniment tracks, and for putting all the CDs together in one set. May God bless you richly for making such a quality product available at a truly affordable cost!!" 90% of what they hear in music! We've been teaching the ABC's through music for years. Now comes a comprehensive songbook of the old and new testaments, teaching dozens of the best - loved Bible stories in song. Also included are lullabies, Christmas songs, and lots of great new Praise & Worship just for kids!!! Created by Dove - Award winning songwriters, this collection is full of long-time kids favorites and new songs with unforgettable melodies designed to make learning scripture fun! Recorded using some of the best musicians in Christian music, Music for the Little Soul is a smorgasbord of musical styles - pop, country, fifties, big band, disco, reggae, and much more! Your kids will learn about music as they are praising God and learning the Bible!!! This 164 song set - the equivalent of ten full length albums! - comes with instrumental tracks to all of the songs so that your Sunday school or home school group can perform them at your church! That's 328 tracks in all! An amazing value!!! WOW! The kids are eating them up. I have to keep one set in each of their rooms. They sing the songs all the time. And they are teaching them to their friend, the daughter of the unsaved neighbors next door. You are accomplishing your mission and I thank you! According to The Barna Group nine out of ten parents of children under age 13 (85%) believe they have the primary responsibility for teaching their children about religious beliefs and spiritual matters. 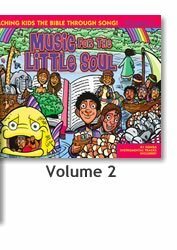 Music for the Little Soul is a valuable tool to help teach the Bible and Christian values to your kids! CHRISTIAN PARENTS & THEIR KIDS! And GRANDPARENTS! - MAKES THE PERFECT GIFT FOR THE NEW CHRISTIAN PARENT!!! The full set includes these great albums!!! Includes the title track, Rise and Shine, Indigestible Jonah, & Sol, Sol the Know it All and 13 more! Includes the title track, If You're Happy and You Know It, We are All God's Children, and 14 more! Includes the title track, Hallelu Hallelu, Don't Love Stuff, Go to the Ant, and 13 more! Includes the title track, Little Children Come Unto Me, Cockadoodle-Don't, Jesus Teach Us and 13 more! Includes the title track, No Room in the Inn, Jesus is the Reason for the Season, The Lord Sent a Baby and 11 more! Includes the title track, When the Saints Go Marching In, Hairy Hairy Sam, March March March March March March and 13 more! Includes the title track, Amen!, Do Lord, Everyone's Important to Jesus and 13 more! Includes the title track, Jesus Loves the Little Children, God is Love in Any Language, Patience and 13 more! Includes the title track, Kumbaya, My Goodnight Prayer, Count Your Blessing Instead of Sheep and 11 more! Includes the title track, Silent Night, The First Noel, Happy Birthday Jesus and 11 more!